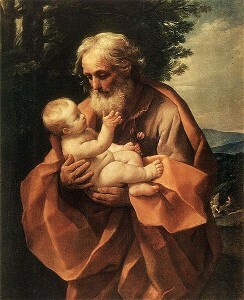 Holy Joseph, you were always most just; make us relish what is right. You sustained Jesus and Mary in time of trial; sustain us by your help. You provided for all the needs of Jesus and Mary: help the needy of the whole world. You rescued Jesus form Herod who sought to kill Him: save us from our many sins. You were the foster father of Christ, the priest-victim; make priests faithful to their calling. You were the foster father of Christ, the Divine physician; sustain the sick and obtain relief for them. You died the holiest of deaths in the arms of Jesus and Mary: intercede for the dying. You were the intrepid guardian of the Holy Family; protect all Christian families. You cared for Jesus with true fatherly love: protect all children in the world. You were a dedicated and honest worker in your trade as a carpenter; teach us to labor for Jesus. You were the faithful and chaste spouse of the Blessed Virgin Mary; preserve in all hearts a love of fidelity and purity. You were a model single person and a model father later on; help all human beings to imitate your virtues. Amen.